Open converted EML files into Multiple Email Clients Windows Mail, Windows Live Mail, Thunderbird and Outlook Express and import process. The tool supports adding immense of the MSG files into EML file format. You can convert all the emails at one go or else can even choose few files for migrating into EML file format. Just browse the MSG files from the specific location within the machine and convert into EML file format. After adding MSG files, software will make a list of emails. This will show the MSG file properties such as email sent from, subject, and file location so on. The software is completely reliable to work with. It will not cause any damage to data at all while making a move of MSG files into EML. Thus, for the sake of reliability, you can trust the application and achieve best ever consequences ahead. This versatile software has immense of the capability to convert bulk MSG files into EML file format. It takes few minutes to make bulk data move from Outlook to EML file format. Software offers the facility to test the tool’s features and working process and this is why freeware demo edition is suggested to make use of. 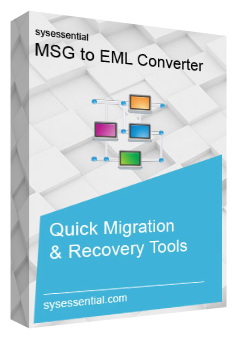 Through free trial edition, you will be able to acquire complete details how tool executes migration of MSG into EML. The demo will convert first 10 emails into EML file format. After conversion is done, software will ask you to choose to desired location for saving converted files. You can select the location on your own and save data in the new folder or in any of the already existing folder. This application is consisted of so many latest technologies. Thus when users make use of the tool, then email migration troubles will not occur at all. How free demo run is different from fully operable mode? In free of cost trial edition, you can catch glimpse of export of 10 emails from MSG files into EML. Also, this mode helps in testing the software’s features and working process. You will be able to attain complete idea how tool operates. But full licensed edition will convert all the emails from MSG into EML. Full licensed run is a paid version. Please recommend the phone number for connecting with support team. Is software supportive of specific file size? Will the application supportive of importing output EML file into other email clients? Cost of licensed edition of Sysessential for MSG to EML Converter is mentioned in the main website but if you wanted to diagnose other things along with cost then call at the helpline number of customer care team and seek the cost related details soon. Is this application supportive of making swift data move for less tech savvy people? After deciding move into Thunderbird email application, my first preference is to take away Outlook’s MSG files along with me. For this, I decided for using some third-party software tool and thus decided for choosing Sysessential for MSG to EML Converter application for converting all the emails. I am so proud of my decision as the application moved all the emails so easily into EML file format which I imported into Thunderbird later.